Whitney Houston may be gone but her legend will always remain. We look back in time. She could not have said it better. 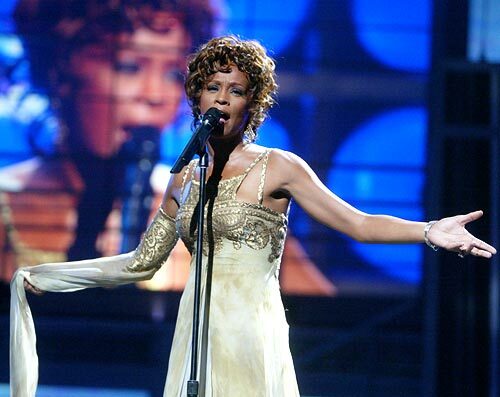 Not many can boast of a pitch and purity like Whitney Elizabeth Houston. Her ability to lift the right words by lending them a completely unexpected twist till they became an entity of their own made her a sheer pleasure to listen. The celebrated singer/actress was discovered dead in her hotel room on February 11. She was only 48. Here's bidding the songstress a final goodbye as we browse through the striking pages of her journey from a gifted kid to pop icon. Born in Newark, New Jersey on August 9, Houston was raised in an exquisitely musical backdrop. 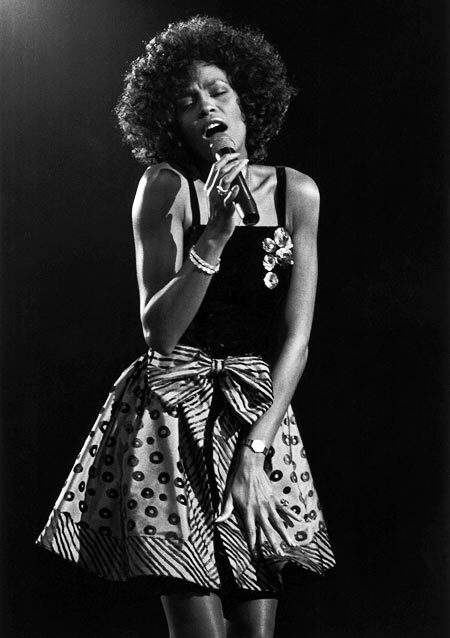 Her mother, Cissy, godmother Aretha Franklin, along with cousins -- Dionne & Deedee Warwick -- ensured Whitney got a good dose of their musical expertise in genres like pop, gospel, soul, R&B into her being. From performing solo in the church choir to impromptu sessions with her mom during the latter's club performances, a teenage Whitney send out clear indication of things to come. Her twinkling eyes and soulful smile didn't go unnoticed either. Houston graced the cover of several teen fashion magazines like Seventeen, Cosmopolitan and Glamour. Her stint for Seventeen marks her as the first African American to adorn the magazine's cover. With the release of her self-titled album, Whitney Houston (1985), her career took off in a way she could have only imagined. Right from rave reviews by prestigious publications like Rolling Stones and New York Times to topping Billboard charts, Houston's golden rendition of grand melodies like Saving all my love for you, Greatest love of all and How will I know achieved giddy levels of popularity and a well-deserved Grammy for Best Pop Vocal Performance, Female. Whitney Houston was, now, a certified star. Following one glorious act with another, her follow-up Whitney (1987), which debuted number one on Billboard 200 with the hit single, I Wanna Dance With Somebody (Who Loves Me). 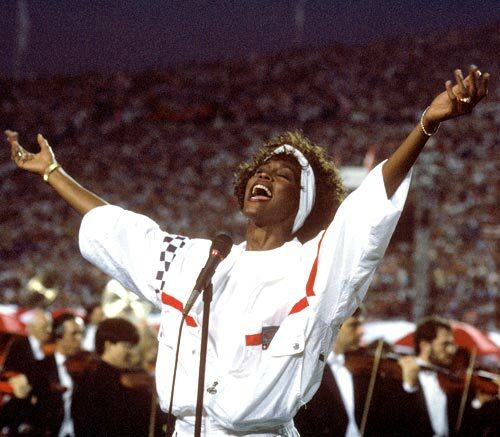 Her spectacular delivery of The Star Spangled Banner during the Super Bowl XXV in 1991 drew tremendous appreciation as well, prompting its release as a single and video. Later, albums include I'm Your Baby Tonight, My Love is Your Love, Just Whitney and I Look to You. Houston's characteristic tenor, along with her fashion statement, big hair, glimmering sequins, a towering persona and unprecedented popularity etched her image as a pop diva inspiring and influencing a decade of musicians. In 1992, Houston made her debut on big screen playing an extension of herself in a schmaltzy romance, The Bodyguard co-starring Kevin Costner. 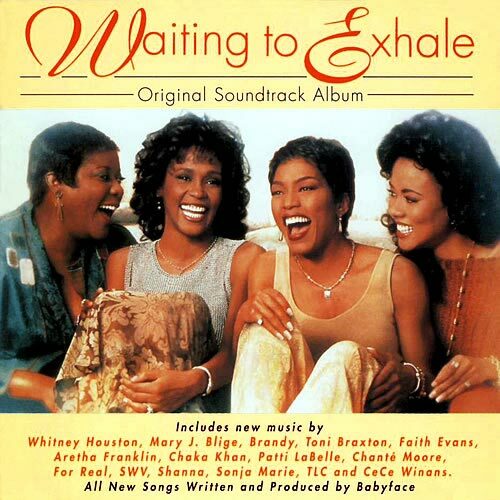 The movie, as one would expect, is best-remembered for Houston's terrific soundtrack, including massive chartbusters like I'm every woman, Run to you and her most iconic performance, I will always love you. Other acting assignments include Waiting to Exhale and The Preacher's Wife. Even though her movies did alright, her acting career could never compete with her accomplishments and identity as a singer. Her last film, Sparkle, is scheduled to come out in August this year. Houston previously dated comedian Eddie Murphy before settling for R&B singeer Bobby Brown in 1992. Together they have a daughter, Bobbi Kristina. After some good years together, cracks began to surface in their relationship attributed to alleged substance abuse, which she eventually confirmed in a chat to Oprah Winfrey on the latter's show. It affected Houston mentally and physically even as the couple drew flak for their bizarre turn in the reality TV series, Being Bobby Brown. The duo ended their marriage in 2007. Houston picked up the pieces and made a comeback with I Look To You. Like most extraordinary music idols, her life is defined by incredible highs, stormy battles and remarkable talent. 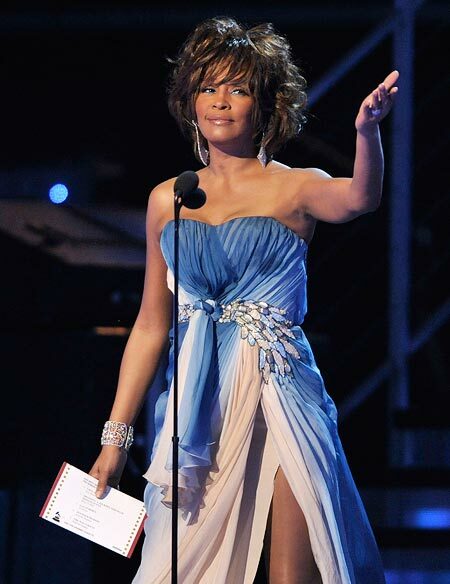 So long, Whitney. Will always love you.